and then Blogger decided to eat it or something and I just don't have the energy to rewrite it right now. Instead I'll leave you with this which is unrealted to the post I was writing and will be part of another post as soon as I find the time to write it along with the one I lost. Um...if I could read that, it would be awesome. What does it say? 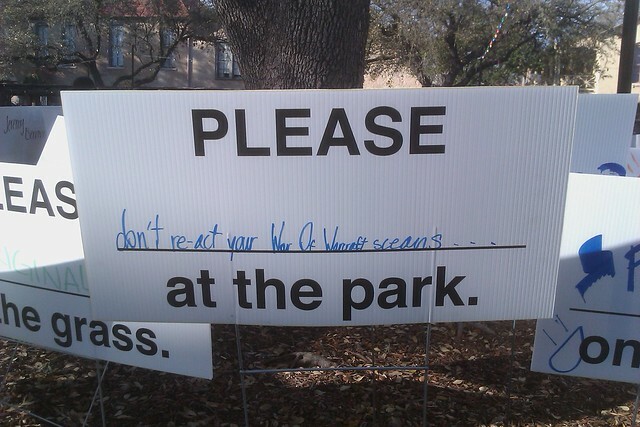 Please, dont re-act your War of Warcraft sceans at the park. Thanks Kandis! These signs were awesome!